Dogal Strings are the first choice of many teachers, players and students and are some of the best value strings available. Produced in Venice since the 1950s, Dogal strings are beautifully made from fine quality materials with multiple windings, allowing easy response. Most of the production process is still done by hand, with minimal tolerances over the full length of each string. This gives a more uniform feel and balanced tone. The essence of Dogal strings is long experience and constant reseach. 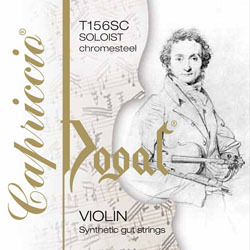 Dogal violin, viola, cello and double bass strings are produced for both student and professional players. Strings are carefully packed to ensure that the strings reach the players in perfect condition. Dogal Green Label strings are widely used for teaching purposes and are ideal for student level instruments with their easy response and stable tuning. These reliable bronze wound strings are one of Britain's best-selling strings. Dogal Red Label strings are good quality strings that are perfect for newer instruments. These superflexible strings have a steel core but have a similar tension to gut strings and produce a bolder, sonorous tone that is popular with players and teachers. Dogal Blue Label strings are aimed at the professional player. These fine super flexible chrome strings are ideal for soloist use and have a similar tension to that of gut. Dogal continues to use many of the same production processes and materials as it has done for the last 60 years. The essence of Dogal’s quality is their long experience and constant research, backed by co-operation with top musicians.